This project is for educational purposes only. All design works © Chi Pham unless otherwise stated. Images appearing on this project cannot be reproduced in any media, website, blog or social network. Redesign the brand identity of an existing product or service that you find useful, interesting and/or relevant but which you do not think it receives enough attention/appreciation from people. BlaBlaCar is the world's largest long-distance ride-sharing community. 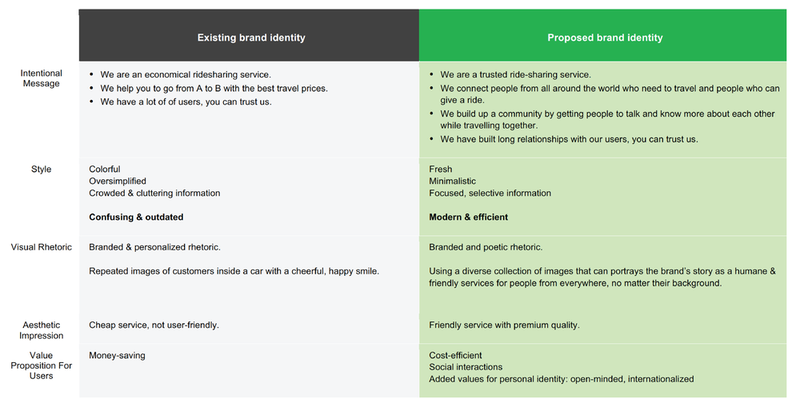 It is a platform that connects drivers and passengers to travel together and share the cost. The business model focuses on drivers who are looking to fill empty seats during journeys they would have been making anyway. The name "BlaBla" emphasised on the connection between people by chatting or sharing experience. BlaBlaCar is mainly operated in Europe (available in 22 European countries). Their main customers are young people between 20-35 years old which travel mainly for pleasure with limited budget, and passengers who have to do frequent commute between small cities in Europe. - National ideology: technology has supported human to be more independent and more powerful at the same time. With Internet, everybody has access to the same knowledge from anywhere around the world. Rapid developing online social media and incrementing call of privacy have jointly contribute a phenomenon that people tend to live in a much more small off-line community. Negative, violent news and information easily spread out faster and catch attention, which results in more doubts and distrust. People are more skeptical towards others. - Citizens identity projects: people (especially young people from 20-30) feel more lonely and lost in big cities. Millennial generation tend to travel more often, move to other parts of the world to study or work. They find it harder to connect and adapt to the local life or the new environment. Similar situations applied to people who are older but also need to travel often. They find themselves isolated in a world where everybody just looks at their smartphones and not talking to each other. How do you get people to be more open and want to connect to people they do not know? How to get rid of the mental borderline in each other? How do you build trust in the society? BlaBlaCar is a trustworthy, efficient travelling service, a trusted community for people regardless of their background. Keywords: innovation, technology, nature, adventure, environment-friendly, youth. Nexa Bold is characterised by excellent legibility in both – web & print design areas, well-finished geometric designs, optimised kerning etc. Nexa is most suitable for headlines of all sizes, as well as for text blocks that come in both maximum and minimum variations. The purpose of the advertising campaign is to promote the new brand story of BlaBlaCar, focusing on the human connection that was addressed in the cultural contradiction mentioned above. A card game for high-school students looking for their passion.